A solid approach makes for a solid exit. 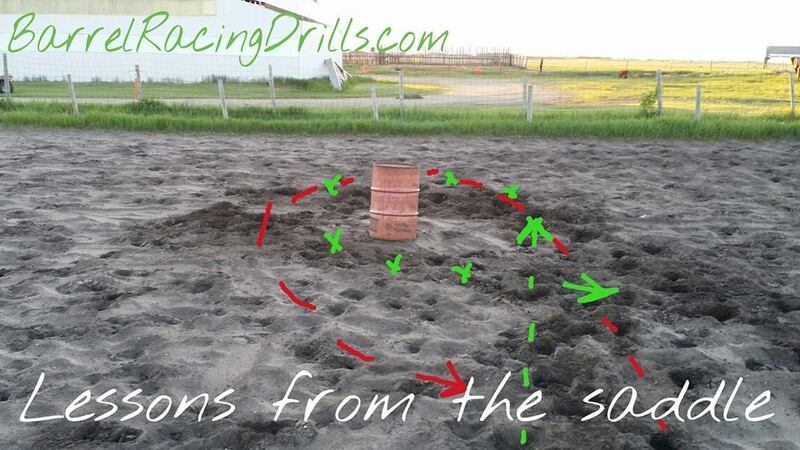 With second barrel, you want to make sure you are riding right up into the turn and getting your horse up into the “hole” (past barrel) before starting the turn (green). So often the horse and rider enter second barrel too wide, or in an arc (and hip to outside) which will cause the horse to leave the turn wide (red line). This is also likely to turn into shouldering. 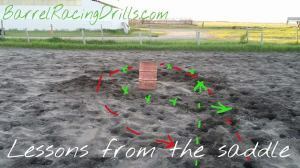 The tracks in the picture were made loping through on a 16 hh horse. The tracks are 4-5 feet from the right of the barrel and closer upon exit. With a smaller horse I’d be aiming for the inside of those tracks at the entrance point. I prefer to take my room deeper up into the turn so we are set up to leave straight and strong with a good approach to the next barrel.